Tanglewood Hills is a family run business established in the Quad Cities in 1990. Initially, the Pavilion reception hall was built. As a result of many inquiries as to places in the area to get married, the Chapel and Evergreen Room were built providing a venue to accommodate all your wedding needs. We have a beautiful area outdoors for weddings or just a place to let your guests relax and have fun on the deck and patios or setting up games on the spacious lawn. We are known for our personal service and going the extra mile to make sure your day is everything you dreamed it would be. 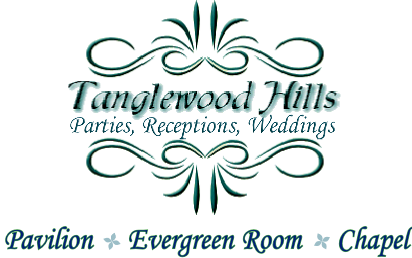 You will work with the same Tanglewood Hills staff from your booking date to the end of your special event. Please feel free to stop by and visit our unique venue. Please call: 563-332-5252 for all dates other than Saturdays.